Scanavo's product line-up consists of optical disc media case solutions for any video, music or software products. The cases are available in 7mm, 14mm, 22mm and 30mm thicknesses, providing storage of one to twelve discs in one efficient case. The patented Overlap™ System minimizes the amount of space used to store discs so there is more room for booklets. 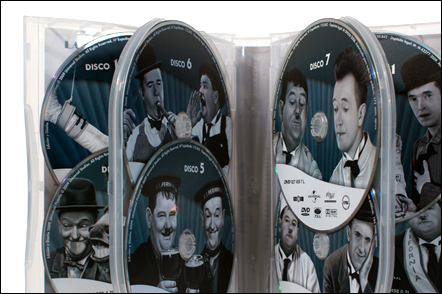 The unique way of presenting the discs in an overlapping fashion also allows full view of all discs when the case is opened. Our hub design provides secure disc retention, making sure these cases protect your content and stand up to whatever purpose required. Most Scanavo disc media packaging products are designed and built for use on high volume automated packaging equipment. Check our our new Card Pack cases - ideal for gift cards, credit cards, bank cards, loyalty cards, access cards. Contact a Media Packaging Expert Now!